London is one of my favorite cities and I actually try to go every year. I even had the opportunity to live there for a month, when I had a month's sabbatical at a former job. As many friends often ask for recommendations on what to see and where to go, I've compiled a list here. Check back for updates. City Secrets London: The Essential Insider's Guide brings together the recommendations of artists, writers, historians, architects, chefs, and other experts whose passionate opinions and highly informed perspectives illuminate well-known sites as well as overlooked treasures. These expert travel companions share with you their favorite little-known places including restaurants, cafés, art, architecture, shops, outdoor markets, strolls, daytrips, as well all manner of cultural and historic landmarks. I always make sure to find time for at least one London Walk. This is one of the premier walking tour companies in the world. The London Guides are actors, attorneys, writers, historians, and I've never been on a walk that disappointed. They take you into the nooks and crannies of London. Duke's Hotel Bar, Dukes Hotel, Mayfair - This bar inspired Ian Fleming's "shaken, not stirred" martini directive for James Bond. It's a tiny place with excellent cocktails. Martinis are excellent. Better to go on a weeknight - we liked the staff better. Sir John Soane's Museum - the home of the architect who designed the Bank of London. He also traveled widely and collected all sorts of things. The house is small but he tricked it out with all sorts of architectural gadgets to make it seem bigger. The Temple Church - the Knights Templar Church near the Inns of Court, where some of the scenes from the "Da Vinci" code were filmed. The British Library is definitely worth a look. It's near King's Cross Station. They usually have interesting things on display. You can also see Platform 9 3/4 at King's Cross! The British Museum is a must-see, but don't take it all in in one day. It's enormous. For your first visit: the Great Court (and be sure to read Tennyson's quote in the floor); the Rosetta Stone; and the Elgin Marbles. There's a nice pub across the street from the main entrance. There's also a famous occult bookstore a block away, Atlantis Bookshop. Portobello Market - on Saturday mornings, the road is lined with antique dealers, second-hand carts, etc. Located in Notting Hill. If you saw the movie, you probably saw Portobello Rd. Borough Market - in Southwark. Only open on Saturday mornings. There has been a market on that location for over 1000 years. Primarily a food market, it's fun to poke around and try samples. The George Inn is nearby - it's an authentic 17th-century coaching inn and pub with oak beams and large courtyard seating area. The Shard - now the tallest building in London. It's stupidly expensive, but worth it to go to the 72nd "open air" floor. Even the bathrooms have amazing views! If you get a chance, try to have lunch at The Blackfriar Pub. The interior is all Art Nouveau - simply gorgeous. There's a ghost, too. Harrod's food hall - great fun to walk around and browse, just for the decor, as well as the amazing assortment of fine foods. Kew Gardens. The National Archives are also located in Kew, where you can see the Domesday book. We saw whales yesterday! Most of us were greeted at 7 am by a wake-up announcement by the captain, who reported 2 humpbacks off the starboard. Fortunately, that is the side our cabin is on, so I was out of bed like a shot, jumped into my shoes, threw on a jacket, grabbed my camera, and went out onto our balcony. As it turned out, the whales were dozing, so it was kind of hard to spot them. They continued to hang out near the boat most of the morning. Overnight, the ship sailed south through the Gerlache Strait, a stretch of water separating the Palmer Archipelago from the Antarctic Peninsula. The scenery is quite spectacular - magnificent ice (you don't hear those two words used together often) and lots of wildlife. Penguins are everywhere - in the water, leaping like dolphins, or on the ice floes. The morning's excursion - not a landing this time - was a Zodiac tour of the area. We started out by visiting the whales. This meant keeping the boats at least 15 meters away - humpbacks average a length of 45 feet and their flippers can be as long as 15 feet. We didn't see much of them except their backs and blowholes. They were quiet because they had had a really good feed during the night, and they were still digesting. Apparently there had been some activity between breakfast and the first landing, as the photographer on the expedition team got a shot of one of the whales breaching. We missed that. The tour continued around some beautiful icebergs, on one of which we saw a Weddell seal. We also stopped by a ship wreck. Back in 1915, a whaling ship carrying whale blubber and diesel caught fire. The cargo was worth more than the ship, so the crew sunk the ship to save the cargo. Today it is a home for nesting Antarctic terns (see photo). Around lunchtime, the captain announced that a minke whale had been spotted off the stern of the ship, but by the time we got there, it was gone. We've learned, on this trip, to carry a pack wherever you go on the ship, so that we are always prepared for a photo opportunity. The pack contains camera, hat, gloves, and jacket, so if you have to go on deck, you won't freeze. Yesterday afternoon, we visited a spot where we had the option of taking a strenuous hike or visiting a Gentoo penguin colony. Chris took the hike, I opted for the penguins. It's an enormous colony, and the Gentoos' breeding season was just beginning. I also got my first look at penguin highways. Yes, these are a thing. Rookeries are generally on higher ground, so penguins create pathways in the snow to get to and from the beach. It's hugely entertaining to watch these busy little birds going to and fro. Occasionally - usually if humans are too near the highways - penguins will detour across the snow, which can be tough going. I often saw them "tobogganing" - maneuvering across the snow using their flippers and feet. I tried to get video, but the penguins knew this and every time I started videoing a penguin doing this, it would promptly get up and start waddling. Then, in the evening, we were visited by a dozen or so orcas. They were hunting for penguins in the waters around the ship (and someone got a photo of one with a penguin in its jaws). These we saw, and got some photos, and I got a glimpse of two orcas swimming perfectly synchronously just below the surface of the water. Definitely an equal-opportunity day for the mammals. I'm always really tired at the end of the day here in Antarctica. It is most definitely due to all the fresh air and exercise, but I also think it's all the preparations we make for landings and cleanup afterwards. I then apply 30+ sunscreen (the ozone layer is thin here, but happily, it is gradually coming back). I then gather up my glove liners, RayBans, parka (into which I have tucked a pair of glasses and my ship ID/key card), personal flotation device (PFD), and rubber boots. I then slog along down one deck to the Grand Salon, where I put on my boots, parka, PFD, and RayBans, and get in line to get on the boat. Many passengers go prior to the 15-minute call before departure, so we can be some of the first ashore and have more time. Before we even get into the boats, we have our card swiped (this is how the crew knows who's on the boat and who's not), troop down a flight of stairs, walk through a trough of disinfectant, then down into the Zodiac. The crew has a remarkably efficient system for loading and unloading the Zodiacs. Two of them take your arms in fisherman's grips, and you step down from the deck onto the pontoon, and then step into the boat, where you are directed where to sit and you go immediately. When you land, the person closest to the front of the boat scooches up to the bow, faces the stern, and swings their legs over the side and onto the beach, or water as the case may be. Then the next person goes, and the next, and so on. The process is reversed when you get ready to return - you sit on the pontoon with your back to the bow, swing your legs over, and scooch down so the next person can get. Mind you, you are doing this with all your layers of clothing and gear. Once back at the ship, you are helped out of the Zodiac (step, pontoon, deck), and then through two disinfecting baths. The first is to make sure no penguin guano comes back with you. You put your foot into a tub lined with scrub brushes and filled with a soapy bath, and scrub your boots really well. Before you go upstairs to the Salon, you walk through the vat of disinfectant again. This is all designed to minimize the chances of spreading disease among penguin colonies. You then troop upstairs, remove your boots on deck, get swiped in, and troop back to your cabin, where you leave your boots out in the hall on a mat, hang your PFDs on the railing, and then, in your cabin, take off all your gear and drop it in a pile in approximately the same order that you will need to put it all on again the next time. There are two landings every day - morning and afternoon. The passengers are divided into two groups - Discovery and Endurance, both the names of ships used by famous Antarctic explorers. Chris and I are in the Endurance group, named for Shackleton's ship. Each landing has two portions - one group goes first, and then the other goes when the first is back. It's a long and exhaustive process, but so worth it. And by comparision, getting ready in the morning for a brisk winter's day commute will seem like a walk in the park. Seeing penguins in the wild is fantastic - one of the highlights for me, on a trip that has so many. After years of seeing these birds in captivity in places like the New England Aquarium (or in nature documentaries), being a visitor on their turf is very special. As you can imagine, penguins are incredibly cute and have loads of personality. A visit to a rookery results in hundreds and hundreds of photos - every minute is a photo opportunity. We were fortunate to make this trip early in the season - the signature penguin aroma was not bad at all. The penguins we see on this trip all belong to the brush-tail family: Adelie, chinstrap, and Gentoo. Chinstrap and Gentoo penguins are considered sub-Antarctic species, but have become able to make their way further south as climactic conditions are changing. Sadly, the numbers of breeding pairs of the little Adelies are decreasing rapidly on the Antarctic peninsula. No one is sure why, and it's not clear if this is the case in other parts of Antartica. All species have begun their breeding seasons, although the chinstraps and Gentoos are behind the Adelies schedule-wise, as they travel farther. So each rookery we visit is a beehive of activity. We visited an Adelie rookery on Brown Bluff on Antarctica Day 1 (12/13), and I think I saw pretty much the entire penguin lifecycle: nest-building, eggs, hatching eggs, chicks, and even some penguin romance. That was really surprising to see so late in the season, but our ornithologist said that it's practice and probably won't be productive. The same is true of the nest-building activity we saw - much of it is practice by the younger birds. Penguins build nests of pebbles. It's hard work; each pebble is brought up to the nest in the penguin's beak. They drop it on the pile, and waddle back down to the beach to get another one. Today (Antarctica Day 2), we visited a chinstrap rookery on Halfmoon Island in Moon Bay. Chinstraps are incredibly vocal and there were a lot of greeting displays: the birds stand very tall and flap their wings and call to each other. The rookery is high on the slopes of the island. We could see many of the birds industriously making their way down to the beach for pebbles and laboriously back up again. I saw one bird slip and catch himself deftly by planting his beak in the ice and getting back up again. Other penguin factoids: All penguins breed in summer, with the exception of the emperor, which breeds in winter. Older and more experienced breeders tend to have their nests in the center of the rookery, which is also the safest. Seabirds like skuas prey on eggs and chicks. Both male and female penguins have brood patches at the base of their abdomens - spots where there are no feathers, and where the eggs fit just so for maximum warmth. I'm skipping any lengthy accounting of Friday. Suffice to say that the seas were still quite rough, and things were quiet on board. The high points were the briefings on Zodiacs, as well as rules of engagement for Antarctica proper (basically, don't touch anything; don't leave anything; don't take anything). The weather calmed down considerably overnight as the ship entered the Bransfield Strait, which runs between the South Shetland Islands and the Antarctic Peninsula. The first thing I saw out our balcony door was a huge iceberg. It was official - we had arrived! So far, it has been a beautiful clear day, and we have spent the better part of the morning on the foredeck, where we have seen lots of ice - in bergs and in pack ice. The ice is simply beautiful - like nothing I've ever seen before. Sometimes it's hard to distinguish water from ice from clouds from sky - the landscape is just variations on texture and reflection. Other times, the bergs sit like blue topaz in the water and you can't miss them. We had our first penguin sightings, including seeing a bunch of them swimming and leaping like dolphins in the sea off the pack ice. They are considered flightless birds, but they really just fly in a different element than other birds. We will make our first excursion on land this afternoon, to Brown Bluff in the Antarctic Sound. This is a continental landing, and it will be our first encounter with some of the natives - Gentoo and Adelie penguins, to be specific. I'll try to post more later, but now that we have a good satellite signal, I wanted to bring this blog up to date. I hope to be able to post pics, as well. Time to go put the big boots on. Our first night on the ship was actually spent in port. The captain was trying to avoid a big storm that was coming through the Drake Passage. So we set out early yesterday morning around 8:00 am. I was on the highest foredeck, so I had a great view of the whole proceedings. Pictures below (or forthcoming). Seabirds of the Southern Ocean with ornithologist Patricia Silvia. I didn't know much about seabirds prior to this trip, but I have a deep appreciation for them now. These birds live at sea for the greater part of their lives, and are frequently on the wing for days and sometimes weeks on end. They can even sleep on the wing. Prof. Silvia told us that the greatest population and diversity of seabirds are found in the Southern Ocean. Moving Continents: How Antarctica Got Where It Is, with geologist Colin Summerhayes. This was more interesting than you might think. Summerhayes talked about plate tectonics; how scientists discovered, and can measure, the flipping of the magnetic poles over geologic time; and the geological features of the Antarctic peninsula (including an active volcano!). South with Scott, with Rob Caskie. Great story about Scott's doomed expedition. Photography in Antarctica: What to Expect and How to Prepare, with Richard Harker. Hopefully these tips and tricks will result in good photos. As the day wore on, we started to experience storm-force winds (Beaufort scale 10) and heavy seas. Top windspeeds were as high as 55 knots. Seas were as high as 12 meters (36 - 40 feet). I went out on the foredeck for a few minutes - it was exhilarating, very cold, and hard to stay upright. Similarly, when we went to the pool deck to bird watch with expedition naturalists, you could only stand out in the open air for a few minutes. Very hard to stay upright while trying to use binoculars! Gradually, as conditions got worse, the restaurant and bar on the top deck were closed, the pool was drained, all deck furniture tied down, elevators halted, small tables in the lounges put away, and the hatches on exterior doors closed to prevent outdoor access. I have to say that I found all this kind of exciting. Easy for me to say - I don't get seasick. But approximately 50% of the passengers did. We saw fewer and fewer people at lunch and dinner, and more room service trays going up to the cabins. A crew member told us that, if it weren't for scopolamine patches, the number would be as high as 75%. It also would have been much worse on any other ship. Le Boreal has excellent stablizers, apparently the best among all ships going to the Antarctic. But still, the railings in the passageways and in stairwells were all lined with little white bags, and the chambermaid was sure to give us extras. But it was great weather for birds! Seabirds like these conditions as they don't have to work very hard to fly. In fact, often during the day you could see birds going backwards with the winds, just gliding along. Seabirds tend to amass at the stern of the ship, as the propellers kick up squid and other yummy bird delicacies up from deeper water. “When you see someone putting on his Big Boots, you can be pretty sure that an Adventure is going to happen.” ― A.A. Milne, Winnie-the-Pooh. Aaaannndd we're back, after three days of planes and buses, interrupted by brief forays into the actual outdoors. We flew from Boston to Miami on Sunday, and then flew out Monday to Buenos Aires, arriving in the evening, where we met our group. Tuesday was sight-seeing day, as group members continued to arrive through Tuesday evening. A&K had arranged for a bus tour of the city in the afternoon, so we had the morning to ourselves. We took advantage of the time to see the city's famous opera house, el Colon Theater. Chris and I had been to Buenos Aires a few years ago, but missed this gem, so I was glad for the chance to see it. It is spectacular, and I would put it on your must-see list. I will save the details - and the secrets! - for your discovery, but just know that it ranks with the great opera houses of Europe. Acoustically, it is near perfect, so much so that on his one and only appearance there, Pavarotti said he would never return. The acoustics were too perfect, you see, and the great tenor was afraid that the tiniest imperfection in his voice would be heard. We had a celebrity sighting (well, we're 99% sure, anyway). I'm pretty sure that we spotted the Swedish actor Mikael Nykvist, who played the writer in the original Girl with the Dragon Tattoo, in the hotel bar on Monday night. We found out later that something was being filmed around the corner from the hotel. We had to leave for the airport at 5:40 am Wednesday for a 7:00 am flight to Ushuaia, so we were instructed to have our bags outside the room for transport to the airport overnight. I carefully hung my outfit for the next day in the closet, as that and my day bag were the only things I would need for Tuesday's journey to and in Ushuaia. Well. The best laid plans and all that. I got up at 4:30 to get ready. However, my pants were nowhere to be seen. I tore the room apart, coming to the horrifying realization that Chris must have packed them in his bag. Which was already at the airport, along with mine. Over the years, I have tried out various things when I travel. I've traveled with one carry-on, tried out bringing only one pair of shoes, traveled with jewelry and without - all in an effort to see what works best for me. As a result, I have two tried-and-true items that I always pack. The first is a set of pajamas in which I would not be worried about being seen, in case I have to leave the hotel room in the middle of the night (this actually happened one October night in Oslo, but that's a story for another time). The second is that I always have a big pashmina in my carry-on. Like the essential towel in the Hitchhiker's Guide to the Galaxy, it is an infinitely useful item. It can be a pillow, a blanket, a shawl for cool evenings. And luckily for me (and our marriage), it can also be drafted into service as a skirt. Looking like a cross between an aging grunge rocker and a homeless person, I wore the pashmina like a sarong, along with socks and clogs. We traveled to Ushuaia, the southernmost city in the world. Known as the "Gateway to the Antartic", it was originally a penal colony, and later became a base for the Argentine navy. It is nestled in the tail end of the Andes and the approach by air is quite breathtaking. Ushuaia is situated on the Beagle Channel, named for Darwin's ship, as Darwin traveled this way on his famous voyage. After a short bus tour of the city and a nice lunch at a hotel with gorgeous views, we were taken to our ship, Le Boreal. It's an expedition vessel, so it is smaller than most cruise ships. It didn't take long to become familiar with the ship layout. The staterooms are very nice - roomy and well-laid out. We have a balcony and plenty of room for stowing things, as we expect heavy weather in the Drake Passage. Our suitcases were waiting for us (and I was happily reunited with my pants), as were our boots, parkas, and waterproof backpacks. I grabbed these photos from Facebook. Apparently, the satellite needs to be in a special polar orbit in order to be able to take these. They are quite breathtaking. 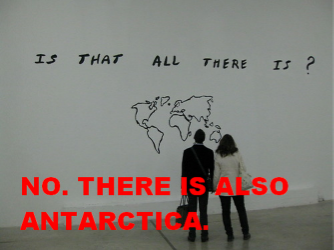 I don't think anyone realizes how big Antarctica is. I've heard the saying "time has no meaning", but it looks like we might be living it on this trip. In Antarctica, technically you can choose your time since at the South Pole itself there is only one “day” and one “night,” each 6 months long; however, when cruising in the Antarctic Peninsula, the ship operates on Argentine time. I think I will choose 9 am. And for those playing the home game, Argentina operates on Greenwich Mean Time minus 3 hours. So when it's noon on the Prime Meridien, it's 9 am in Argentina. Track us on the ship! Apparently, you can monitor most marine traffic on MarineTraffic.com. A friend who just returned from a 21-day cruise of the Panama Canal told me about this. You need to register, but the Basic account doesn't cost anything. So, you will be able to follow us as on the cruise! Our ship is called Le Boreal. We and the rest of the tour board it at Ushuaia, in Tierra del Fuego. I'll remind you to add her to your map just before we leave. I am not an outdoorsy person, ordinarily. I like being outdoors if activities take me that way - working in the garden, having cold white wine on the deck on a balmy summer evening, lying in a deck chair any season in the middle of the night to watch meteors - but I'm not someone who finds things to do to be outdoors. You'd never know it to see what I'm packing. Chris and I went to the REI store in Reading last weekend - that wonderland of adventure gear and clothing. This expedition involved some highly technical and detailed conversations about: layering of hand gear and whether neoprene was the right outermost layer; layering of socks, and whether silk or polypropylene was best innermost layer; and the virtues of merino wool vs. a blend for long underwear (Results: neoprene, silk, and the blend). And then there are the rain pants. Everyone assumes - and with good reason - that travelers venturing down to the Antarctic need to stay warm, and that is true; the Antarctic summer experience will be that of a typical New England spring - 30 - 50 degrees F. Antarctica also happens to be the driest (take that, Sahara Desert!) and windiest place on earth. So warm and windproof layering is the primary dressing approach. However, our on-shore excursions will be via Zodiac boats. There are no wharves or docks, remember. We pile into these boats from the ship and then pile out again on shore, or close to - we'll most likely be getting out in the water and wading ashore. We rent waterproof boots from the expedition company, but the rest is up to us, and waterproof gear is the order of the day. So yes, on the driest place on earth, I need to also think about waterproofing. The rain pants are reminiscent of snow pants, in that they are a protective layer, but there the resemblance ends. I used to dread wearing snow pants to school when I was little. Bulky and usually involving suspenders sort of mechanism to stay on, they took forever to get on and off. Which, if you are trying to get to your bus at the end of the day, was aggravating and stress-inducing. But the rain pants are remarkably light and flexible - not like snow pants at all! What I have not been thinking about - or trying not to think about - is if all this expedition gear makes me look fat(ter). Not that I need to impress anyone, but I don't want to be confused for a penguin in our photos. Photos next time - promise! When we were first planning this trip, I remarked to Chris that it will be weird to travel somewhere with no options for local dining or shopping. I spoke too soon. As it turns out, there is a gift shop on Antarctica. Palmer Research Station - which is on our itinerary - has a gift shop that supports the station's social activities. They sell t-shirts, sweatshirts, sweatpants, postcards, coffee mugs/thermoses, water bottles, pins, patches, hats, and magnets. They sell postage at the store too, so we can send postcards right from the station. And everything is duty-free. Wherever you go, there's an opportunity to get a t-shirt. Yes, I know. Space is the final frontier. But since it is highly unlikely that I will get there in my lifetime (unless they open a nursing home on the moon), Antarctica is it for me. The first thing my sister-in-law said when I told her we were going is "Are there hotels there?" It's a good question. I think she asked because she didn't think there were any there, but she wanted to make sure. She knows that Chris and I don't camp. But no, there are no hotels on Antarctica. There are also no restaurants, no malls, no hospitals, no police stations, no penguin-themed water parks, and no micro-creameries. The only humans who live there do so on research stations. It really is a frontier. Oh, and no Internet. Did you get that? NO INTERNET. Some years ago I took my first trip to Hawaii. As we crossed the Pacific Ocean, it struck me how remote and isolated Hawaii is from the mainland. If anything went badly on the continental US, we would be stuck out in the middle of nowhere. Of course, a tropical paradise is not the worst place on which to be stranded, but at the time, that line of thinking gave me the willies (fellow claustrophobes will understand). But Antarctica is the real deal. Remember the Russian vessel that was stranded in ice earlier this year? Every one got home safe and sound. Still, when I remarked about this story to my friend Ann, she said "GO! And don't worry! The worst that can happen is that you end up on CNN." It will be an adventure one way or another. Well, it wasn't a costume. Not an Oriental one, anyway. But it wasn't for lack of opportunity, certainly. The Tarazade Dance Festival had the requisite local vendors - 5 or 6, I think - who set up shop outside of the workshop location. It was fun to see what the Turkish dancers are wearing. It looks like long layers of beads are coming back into style. There were a lot of print skirts and accents mixed with the beads and sequins - sometimes this worked and sometimes it didn't. Bella was not there, but the other vendors seemed like they had very high-quality goods. Two members of our group were in the market for costumes, so they visited a costumer's shop a few days ago, after the festival. We had heard that the costumers did not necessarily bring their best costumes to the festival. We had also heard that bargaining would be more effective at the shop. And it must have been - Karen got a beautiful red costume and Melanie a gold costume and a purple one. Our intrepid troupe artistic director, Margaret Slocombe, seized the opportunity to negotiate the creation of a custom folkloric costume for us (Origins Folkloric Dance Company). We have a lovely coat/harem pant/silk top combo being crafted for us as I write, which should serve us well for Persian, Armenian, and Turkish Ottoman-era style dance. It was fun putting it together - we were sent into the depths of the Grand Bazaar to find the fabric merchant with whom the costumer worked. It was like dying and going to costumer heaven. The fabrics were incredible - gorgeous colors and sequins and embroidery and trims. I almost wished I could sew so I could take advantage of all this beautiful material. - Wonderful hand-woven bathrobe and bath sheets - made in weavers' homes on ancient looms in the old style - for my husband's birthday. These came from a special shop about which I will write more later. - Music!! A musician came to Sema Yildiz's class one day with a ginourmous bag of CDs, from which I fed heavily. Glad I did too, because I did not see these CDs in a music shop I subsequently visited. I tried to restrain myself and buy things I could really only get over there. Overall, prices weren't so bad. I had heard that Turkey wasn't cheap, but prices weren't exorbitant. Factoid: the unit of currency is the Turkish lira (TL, called "tay-lay"). One TL is roughly equivalent to $0.55 USD.